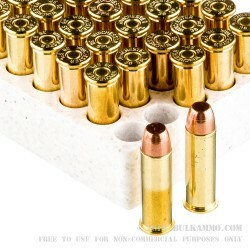 As one of the most popular and well received rounds in the world of high speed revolver shooting, the .38 Special is the foundation upon which most competitive shooters learn to shoot a revolver for the very first time. 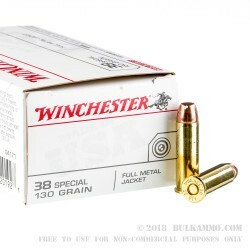 The Winchester 130gr .38 Special Full Metal Jacket should be a staple of any shooting regimine, and will help you to elevate you revolver shooting up to the next level. The Winchester 130gr .38 Special FMJ utilizes a smooth semi-wadcutter design for smooth feeding and ejection of the within the revolvers clynder. This smooth round nose design aids in speed loading using either speed strips, loaders, or moon clips, which rival or even accel past semi automatics in the time it takes to reload. 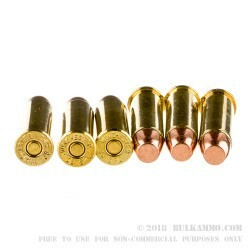 The thick copper jacketed 130gr rounds provide excellent weight retention and accuracy characteristics, and will excessively foul your barrel with lead unlike traditional .38 special rounds. 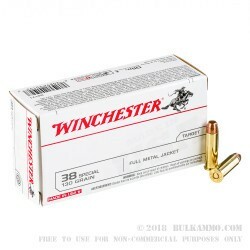 Recreational and first time shooters looking for a pleasant and economical round to enjoy will be plreasntly surprised with the Winchester 130gr .38 Special FMJ before trying any alternatives.